A group of divers will again visit Fortune Pond, Michigan on June 23rd and 24th. Come on by and dive with us if you have the time. Hopefully I'll have my UDS-1 back and in operation. If not I should have my own BC on a ABS. I need to determine if I like the ss backplate or BC configuration better. As I see it, neither would be true vintage anyway as the ABS is a design from the 80s. Either way, I'll do my darndest to join you. Don't think I'll have my 2nd UDS-1 done by then. Still apart. There will be another new diver to Double Hose diving there. For those of you coming to Fortune Pond, bring along your Sea Hunt era gear. We are planning on doing a Sea Hunt style dive. I'm bringing some extra smooth skin wetsuits for some of the people come with and I'll have some extra masks and lots of double hoses along too. There will be a ton of double tanks there. Eben and Rich will have a truck full of tanks as will I. I will have my compressor there too. 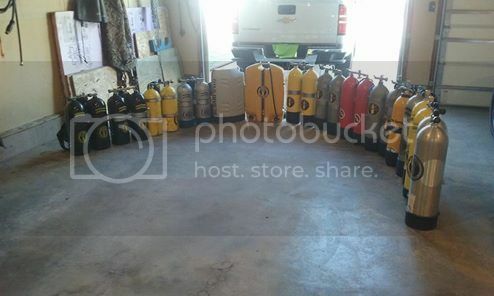 Bringing this assortment of tanks to Fortune Pond to keep up with outfitting 4 divers. I can only make an afternoon appearance on Friday, so I will not have quite so many goodies to bring along. But I am looking forward to diving with you guys. I had to haul all those tanks out into the garage from the basement of the house. And there are more tanks left behind.